Homes on the D’Eynsford Estate in Camberwell were left without any heating for days in freezing weather earlier this year. What really upset residents was that no one answered the emergency helpline at Southwark Council. One resident reported that it was only when they took to Twitter that they got a response from councillors - and then from Southwark Council. A heater was produced for them - but nothing for those who weren't so active on social media. The council demonstrated little care for the many elderly people living on the D'Eynsford on their own. Reassurance, information about the repair schedule, and practical action like the loan of a portable heater is the minimum tenants should expect. The council’s communication with Southwark residents must improve. Eleanor Margolies says: "This makes a mockery of the idea of consultation. The Southwark Spine was meant to make cycling safe for all ages, from 8-80. Hundreds of people took the time to write in with their concerns. I can’t believe Cllr Wingfield has ignored us all. I will listen to residents and fight for a better scheme that reduces motor traffic and is safer for everyone." Southwark Green Party congratulates local community activist Mark Webb on his recently awarded 'Freedom of the Borough of Camberwell', awarded by Southwark Council. Mark is chair of the Camberwell Green Safer Neighbourhood Team ward panel. He's well known locally, often seen staffing the SE5 Forum stall at Camberwell Farmer's Market on a Sunday morning. He has recently been involved in tackling knife crime through leafletting and working with the police to sweep the neighbourhood for concealed weapons. Last year, Mark was nominated for the Metropolitan Police 'Citizen of the Year' and was a finalist at the ceremony at the Park Lane Hotel. There are 63 councillors in Southwark Council. Of these, the Labour party currently has 48 councillors, the Liberal Democrat party has 13 and the Conservative party has two. At the moment, there are no Greens on Southwark Council. Next door, Lambeth and Lewisham have Green councillors – so why not us? Residents get a better deal when councils include different voices. The Electoral Reform Society has shown that people living in areas ruled by ‘one-party councils’ miss out on savings of around £2.6 billion a year! In Lambeth, Green counillor Scott Ainslie has supported the work of the independent 'People's Audit' which has identified errors and potential savings in the Lambeth Council accounts. Across the country, elected Greens scrutinise council contracts and accounts to make sure that councils are fair, transparent and getting a good deal for residents. 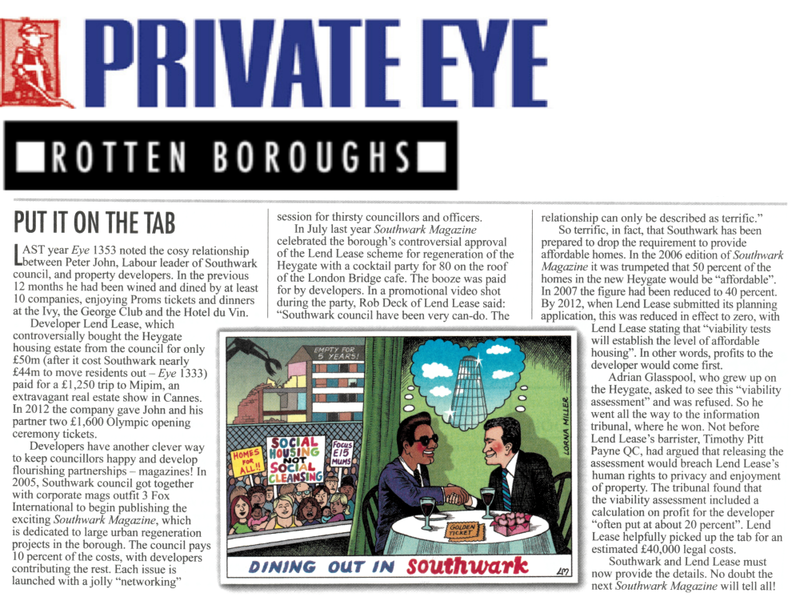 Southwark Council suffers from a lack of opposition. Labour Party councillors have pushed through the demolition of hundreds of council homes on the Heygate and Aylesbury estates, selling the land to private developers. The Green Party opposes the sale of public property for private gain. We will protect council homes and invest in building genuinely affordable homes. Following ongoing community pressure, the planning application to demolish Elephant & Castle Shopping Centre and London College of Communication will now not be reconsidered by councillors until after the local election on 3rd May. Southwark Labour pushed through the previous controversial demolition of the Heygate Estate two months after winning a council election. Southwark Council leader Peter John stated there was “no alternative” to displacing existing communities and building only 3% social rented units throughout the Elephant & Castle Opportunity Area (OA). He was wrong in principle and in fact. I would counter this regressive OA model with a Green Economic Zone. “We need local economies that put communities first, and provide opportunity, dignity and well-being. Whole rivers of wealth run through local places. We need to capture it, because it already belongs to us,” say progressive economic thinkers CLES. A massive thank you to our co-hosts the Friends of Brunswick Park and wonderful band Ceilidh Tree for making our Big Spring Dance such a fab evening. Guests of all ages from across our community were instructed in the art of the do-si-do and the right-hand star, and a good time was had by all. There have already been several requests to do it all over again! Thank you too to Father Nick and Fatima at St Giles church for use of the splendid parish hall, and to the Kernel Brewery, Bermondsey, and the Hill Bakery, Camberwell, for supplies of excellent beer, wine, bread and cheese. A few months ago, a group of neighbours in Nunhead met up to see how we we might act collectively encourage environmentally friendly initiatives. I took responsibility for setting up a bulk buying scheme. We wanted to see how small initiatives such as this could deliver a reduction in waste including fuel and single-use plastic plus encourage positive community action on a neighbourhood level. In addition, it would also make buying ecologically friendly products easier and more affordable than would be the case individually. The first task was to gauge interest via an online poll on the community’s social media page. Fifteen neighbours expressed an interest and a week or so later we placed the first order for the most popular items (washing up liquid, laundry detergent, dishwasher tablets, handwash and shower gel). The weekend after delivery from a single ethical online retailer we ‘set up shop’ and neighbours called by to collect their choice of products. Eco-friendly cleaning business owner Ekaterina Belcheva recently appeared on Sky News to showcase sustainable cleaning techniques. New research suggests that lung function decline in women working as cleaners or regularly using cleaning products at home was comparable to smoking 20 cigarettes a day over 10 to 20 years. The researchers speculated chemicals in cleaning products irritate the fragile mucous membranes lining the lungs, which over time leads to lasting damage and “remodelling” of the airways. "When you think of inhaling small particles from cleaning agents that are meant for cleaning the floor and not your lungs, maybe it is not so surprising after all," said Øistein Svanes, a doctoral student who led the study. Members of the Wells Way Triangle Residents Association have organised informal workshops to help local people look at the plans for redevelopment of Burgess Business Park on Parkhouse Street. The proposal, dubbed 'Camberwell Union' by the developers, would create 505 residential units. The developers claim that with target profit margins of of 17.5% for private residential, 16.67% on commercial, and 6.0% on affordable units - agreed as 'reasonable' by the council's 'viability consultant' - they would not be able to provide 35% affordable housing. What do you do when you see a bike rusting away on the street or on a council estate? Eleanor: It's sad to see an unloved bike! I do a quick check that it really is abandoned. Rusty chains and missing wheels are a good clue. Then I report abandoned bikes on the Southwark Council website. The council cleaning team puts a note on the bike, giving a week or two for it to be claimed by its owner. Eleanor: After a further month in storage to allow owners to get in touch, unclaimed bikes are passed on to local charities like the brilliant Bike Project on Champion Hill. They refurbish old bikes and donate them to refugees. Someone gets a bike of their own and the freedom to get around locally. A bike parking space is freed up for other people who need to use it. And we all get rid of a trip hazard and eyesore. It’s win-win-win!